There’s one Monday in late January that scientists say is the most depressing day of the year. Days are still short, dark, cheerless and cold. The first glimmer of spring – never mind summer – is still some way away and the only reminder of Christmas cheer is the credit card bills hitting the mat. It’s just the time for a week’s escape to somewhere hot. Not easy, of course, if you have school-age kids. But for anyone who can get away, those early weeks of the year maximise the gain from heading south. Four hours’ flying time takes you to the tropics, where the weather should be warm and sunny. What’s more, at that time of year prices are low, there’s plenty of accommodation available and the resorts are uncrowded. Lanzarote is usually sold as a seaside destination – it has great beaches, wonderful weather and sparklingly clean water, the sort you only get when you’re way out in the Atlantic. If that’s what you’re after, Lanzarote’s three main resorts fit the bill perfectly. Puerto del Carmen just to the south of the airport is the biggest and oldest. 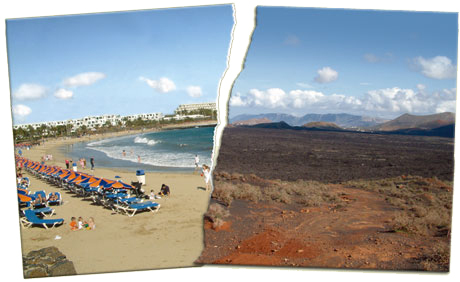 Playa Blanca, at the southern tip of the island, and Costa Teguise, in the north east, are newer and smaller. I’ve stayed in Puerto del Carmen a few times before, so on this holiday we headed for Costa Teguise. The town of Teguise is historic, charming and some way inland, but the resort of Costa Teguise is down on the coast, built over the last 20 years or so around several beautiful beaches. Just five minutes’ walk from the beach, our villa was in a quiet and small development, with no through traffic. With its own pool and perfect seclusion behind high walls, it’s a great base for anyone wanting to do no more than enjoy the sun and stroll down to the beach or seaside restaurants and bars. If you ignore the volcanic backdrop and the weather, Costa Teguise is an astonishingly un-foreign experience. You really don’t need a word of Spanish – you can take quite a long stroll along the seafront before you pass a bar or restaurant with anything other than English on display. But even if you like to be a bit more adventurous, it still makes an excellent base, as the island is small enough to be easily explored if you have a hire car.